Conan wore many hats during his adventures. Conan the Barbarian. Conan the King. Conan the Conquerer. Conan the Steak-n-Shake Line Cook. In this instance, we're talking about Conan the Brigand. 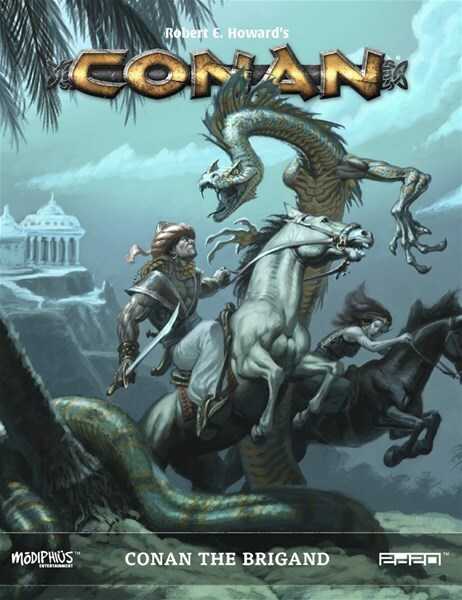 If you're a fan of having the physical version of the book for the Conan RPG in your hand, you can now pick up the print version from Modiphius (they'd previously only released the pdf version). Conan the Brigand is the complete guide to the nomadic brigands of the Hyborian Age, providing the gamemaster and player characters with all the resources to run campaigns that embrace the path of the brigand, or are affected by it. Here within these pages are all the resources needed to bring to life this outlaw world! New material to expand your Conan campaign, with brigand-themed castes, stories, backgrounds, and equipment, allowing you to create your own unique brigands, nomads, and raiders. A gazetteer covering the kingdoms that Conan and his brigands raided — Khauran, Turan, and the city-state of Zamboula. Descriptions of important dignitaries and renegades of the region, including Lord of Khawarizm, Kings Yezdigerd and Yildiz of Turan, Shah Amurath, Queen Taramis and her devilish twin sister Salome, Constantius the Hawk, Baal-ptor the Strangler of Yota-pong, the notorious pirate Sergius of Krosha, and the roguish Zaraporaskan rogue Olgerd Vladislav. Beasts and unnatural monsters — vultures, iron statues, desert devils, gigantic rukh, and the Devil in Iron himself, Khosatral Khel. A guide to running brigand campaigns, with all-new rules for raiding and plunder, and brigand-themed carousing events to fill the time between raids. Gods and magic of the nomadic lands, including cults of Erlik, Ishtar, Tarim, and Yazadi, and magic artifacts such as the legendary Tulwar of Amir Khurum. A write-up of Conan during the period he lived and breathed the brigand life, along with his most notorious followers. Guidelines for running a desert nomad camp, recruiting brigands, surviving in the hostile environments of the southeast, and descriptions of the rewards and dangers of raiding. Developed with leading Conan scholars, this is the place for Hyborian Age desert adventure, just as Howard created it!